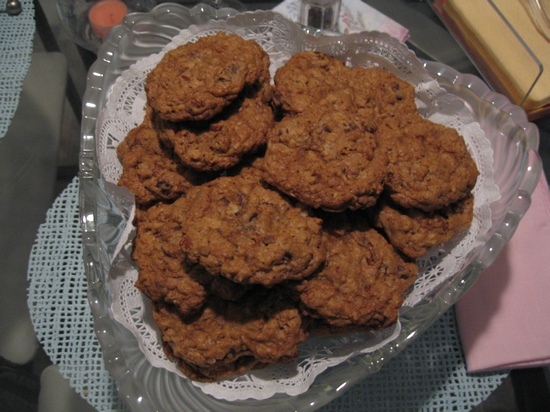 These Cowboy Coooooooookies were baked last July 4th (2007) with my sis-in-law. It is Laura Bush’s recipe. With all the ingredients–3 cups flour, 3 cups oatmeal, 2 cups pecans–we started baking before driving out to watch fireworks, then came back to bake the rest of the dough. So why am I a cookie monster? I must have brought home almost 2 dozen….and omigosh, *giggle*, I ate practically all of it all by myself. Not in one sitting, of course! Heat the oven to 350 degrees F. Mix the flour, baking powder, baking soda, cinnamon and salt in a medium bowl. In an 8-quart bowl, beat the butter on medium speed until smooth and creamy, 1 minute. Gradually beat in the sugars; beat to combine, 2 minutes. Add the eggs, one at a time, beating after each one. Beat in the vanilla. Stir in the flour mixture until just combined. Add the chocolate chips, oats, coconut and pecans. For each cookie, drop 1/4 cup of the dough onto ungreased baking sheets, spacing 3 inches apart. Bake for 15 to 18 minutes, until the edges are lightly browned; rotate sheets halfway through baking time. Remove the cookies to a rack to cool. Yields: About 3 dozen cookies. For 6 dozen smaller cookies, use 2 tablespoons dough for each cookie.